Acquire , Sid Sackson, 3M/Schmidt Spiel/Avalon Hill, 1962/1979/1995. Acquire is a board game based on the business of buying and selling hotel chains. Originally release by 3M in 1962, it was later released in Germany by Schmidt Spiel and Avalon Hill, so it seems to be selling well and is popular enough to warrant rerelease in four decades. It also has made the Speil des Jahres Game of the Year award in 1979 and the Games 100 Alltime Games list. Add to that many positive reviews, and you see we are talking about a popular favorite and a reviewer's classic. The hotels are represented by square tiles that are placed on a 12 by 9 rectangular grid, one hotel tile per space according to the row and column printed on the tile. A player's turn consists of placing a hotel tile, buying up to 3 shares of stock, and replenishing hotel tiles in hand up to 6. When placed tiles are adjacent by column or row, they form a hotel chain which assumes one of the seven hotel chain names: Tower, Luxor, American, Festival, Worldwide, Imperial, and Continental. Each chain's value is represented by stock, initially offered at $200 to $400 per share, but growing according to a table in the rules book, reaching a high of $1200 per share. Adding a hotel tile to a chain increases the price of the stock. Stocks are sold or cashed in when two chains become adjacent and trigger a merger . The larger chain consumes the smaller one. The two majority shareholders in the defunct chain are given a money bonus (again located in a table in the rule book) ranging from $2000 to $12000 for first place, half of that for second place. Each player decides whether to hold, sell, or trade the stock in the defunct chain. As is usual with any commodity game, the object is to get in while the stock is low and sell when it is high. The game ends when one chain contains 41 hotels, or all remaining hotel chains on the board are safe from takeover (11 or more hotels). This is an excellent game of tactics. Luck in the game is limited to the 6 random tiles you have in hand, but the rest of the game is a battle of wits of equally matched sides. Since the game is played in turns with up to 6 players, the 6 tiles limit the options during a turn and help the game move along (much like limiting chess to a choice of 6 moves per turn would speed that game). There are 7 hotel chains, so an Acquire player must battle his opponents in each of the chains. Obviously, you do not have enough money to buy unlimited stock in all chains, so you must choose your purchases wisely. A fun aspect of the game is balancing cash on hand with stock on hand. It is good to keep enough money to be able to buy 3 stock units of your choice when it is your turn, but money in hand does not appreciate and does not help you win the game. The only way to make money is to invest in stock and make that appreciate. A player's biggest windfall comes from having lots of stock in a big high-priced hotel chain. However, being the sole stock owner does not garner you lots of support from fellow players who will be reluctant to help you grow your chain. Other hotel chains with nearly equally balanced stock ownership tend to grow like wildfire because several players try to build the chain to get the stock price to grow. According to the rules, stock transactions are done publicly, but cash and stock holdings are kept hidden. Assuming a totally omniscient player, the best strategy would be to have just enough stock in a chain to be declared the majority stockholder and no more. With this, a player would be able to collect the juicy primary stockholder bonus, but presumably have leftover resources to go after the primary ownerships in other chains as well. The Avalon Hill version of the game gives each player a "special power," an ability to bend the rules. For example one power is to buy 5 stocks instead of the usual 3, or to buy 3 for free on a given turn. I have played this version but I think it adds nothing to the otherwise well matched, and streamlined version of the basic game. The special powers variant adds a lot of post game bickering and debating over who had the better special power, a debate which never happens in the basic game. Although it is an excellent simple model of a business market, the game is a somewhat abstract and dry representation of the hotel business. Because it is abstract, the Avalon Hill board and pieces are no great work of art, about what you would expect from an abstract game. Given a copy of the pricing chart, I'm sure six prisoner's could play this game with bits of paper and a board scratched in a dirt floor. That's no reflection on the playability, on a desert island I would have no trouble manufacturing most of the world's greatest games for me and the castaways, that's just a statement on the componentry. According to Stuart Dagger, the Schmidt Spiel version adds three dimensional pieces of 3 heights, an attempt to beautify the board, but at the expense of the playability of the game. Like Monopoly , 75 percent of the estimated playing time of this game consists of counting money and shuffling stocks. In a social gaming venue, with lots of friends, talk, and good beverages, I have no trouble with all the money changing, but those wanting to maximize strategizing may want to look elsewhere. A solitaire ASCII computer version of Acquire, written by G.C. Crawshay, plays in about one third the time. (Updated 2007/01/16) Since writing this review in 1998, there have been several good online multi-player versions of this game. Some have come and gone, but the best version seems to be NetAcquire by Lorne Nicol of Kensit Systems. A final observation is the spacial look and feel of this game. Like amoebas, the hotel chains expand until they collide and fight with neighboring rivals. There is something strangely reminiscent of Go in this thought. Other games since have borrowed at least a bit of this notion. For instance, the kingdoms in Reiner Knizia's, Euphrat & Tigris also grow and collide and fight. On the one hand Acquire resolves the fight with a simple count of tiles. Euphrat & Tigris also resolves the fight with a count of tiles, but the battle may be in one or more of each of the primary colors (black, red, green, and blue) - in other words a 4 way fight. In all these games, it helps to have good visual skills to mentally map the battlefield. Like many abstract games of skill, this one is pared down to the bone, no extraneaous rules, no strange scoring system, just a well balanced game of equal players vying for the title of richest capitalist. 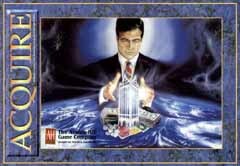 When in the mood for a business game, I give this game my highest honors. [an error occurred while processing this directive] Last modified: Thursday, 09-Jun-2011 12:36:36 MST.